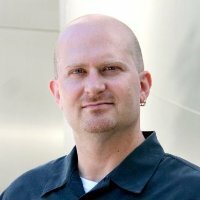 Erik Gamache is a Visual Effects Supervisor at Apple who works on super secret stuff generally related to computer graphics. Erik has been creating digital characters for more than a decade. At Digital Domain, he completed work on films such as “Iron Man 3” and “Real Steel” as an Animation Director. 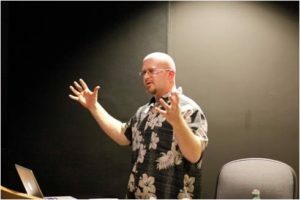 Previously, he supervised animation on “The A-Team,” “Percy Jackson & The Olympians: The Lighting Thief” and “Transformers: Revenge of the Fallen.” He also contributed his talents to “Star Trek,” “The Mummy: Tomb of the Dragon Emperor,” “Speed Racer,” “Stealth,” “I, Robot” and “The Girl with the Dragon Tattoo”, amongst others. Erik’s career began on the animated television show “Roughnecks: The Starship Troopers Chronicles.” In 2003, Erik was nominated for a Primetime Emmy Award in the category of Outstanding Special and Visual Effects for his work on “Steven Spielberg Presents Taken” and is a member of the Academy of Television Arts & Sciences and holds a B.A. degree in Studio Art from Florida State University. I worked at Seminole Productions at FSU after I graduated, doing graphics for the football and basketball teams. While I dabbled in 3D prior to my work at Seminole Productions, during my employment there, I was asked to expand my knowledge. I was also encouraged to get in touch with Andrew Harlow, formerly associated with Seminole Productions, who was working in Los Angeles. He told me to fly out and bring some reels of my work. Being in LA, where I was available to meet in person with companies, made a real difference. I got a few job offers, one of which was working on Star Ship Troopers. However, I soon learned the industry was quite volatile and I was laid off shortly after I had started when the project was cancelled. Despite this minor setback, I had more job offers just three days later because it was a good time in LA to be working in CG. I ended up at Digital Domain and worked for them for 12 years. I became an Animation Director and had the opportunity to work on some great projects with fantastic producers and directors. Over the past five to ten years, the LA film industry has been increasingly outsourced to places like London and Vancouver, where the cost of living is more expensive than Los Angeles. I was asked to relocate to Vancouver, however, after thinking it over, I negotiated a layoff and decided to take my chances freelancing in LA. During that time I did some work for Apple, which led to me working for them on a fulltime basis as a VFX Supervisor. When I started, a 3D program had not yet been developed. My classes were design, web design, and fine arts oriented. I taught myself how to make egg shapes, and eventually, spaceships. I was able to take advantage of the resources at the Meteorology Department, such as the green screen, to do projects on my own. I also took a photography class, which was very helpful, because motion pictures are really photography over time. Seminole Productions also encouraged me to find my wings and pursue a career in Los Angeles. Know what you’re getting into and do research. Many people go to LA with very romantic ideas about the film industry, when in reality you’ll be living a nomadic lifestyle. The US is losing its hold, and what once was an American invention and the standard for quality is now being replicated in other markets around the world. Talent is being forced to move so it’s become a young man’s game. It’s very difficult to have a family because you’ll be traveling a lot and living in expensive cities. Because of FSU’s fine art focus, I often felt a little alienated. I remember during one critique, someone commented that my painting looked like something that would hang in a hotel lobby and it was too “commercial”. This was obviously meant to be critical but I interpreted it positively because it meant that my work could sell. Don’t discount making money with art by learning to implement someone else’s vision and being okay with that because it’s their idea, not yours. However, always make time to pursue your own vision and be creative with your projects whether you are able to make a living doing it or not. It’s okay to be realistic and have a back up plan.